This is the brine to use for most cuts of meat and poultry that will be roasted. 1. Heat 1 cup of water to boiling point add the salt and stir until all the salt has totally dissolved. 2. Place in a non-reactive container (glass, plastic, stainless steel, zip-lock bags etc). Add the remaining water and stir. Make sure that all the salt has dissolved. Wait until the brine has reached room temperature. 3. Add your cut of meat make sure that the meat is completely submerged (that is totally covered in the salty water) if need be you can weigh down the cut of meat with a clean plate (etc). If using plastic bags make sure that the meat is totally covered in brine and make sure that is bag is locked securely. 4. 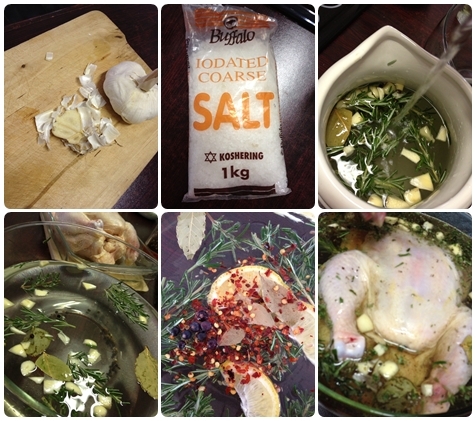 Cover the container with plastic wrap to prevent odours contaminating the flavour brine or the brine leaking. 5. Place the container into the refrigerator for the soaking time suggested by the guidelines above. 6. If desired you can air-dry your poultry (usually over night) in the refrigerator if you wish to have crispy skin on your bird. It is best to pat dry your brined item (inside and out) with paper towels before cooking. I made double the brine solution. Once the chicken had sat overnight in the brine I took it out of the solution and allowed it to dry out a bit in the fridge. Grate an onion and combine with some freshly grated garlic, ground ginger, black pepper and saffron. Cover the chicken and place in the tagine with some stuffed green olives. 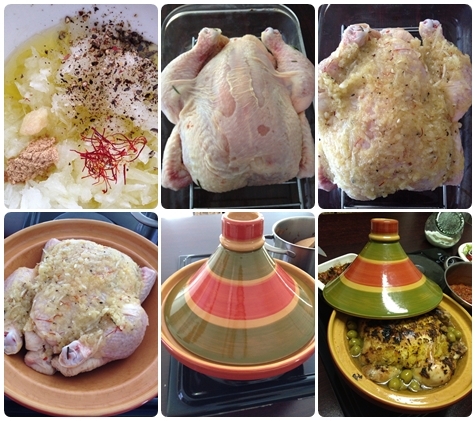 Roast the chicken in the tagine. Morocan Chicken tagine served with cous cous, tomato relish and roasted cherry tomatoes and mushrooms. The brining was well worth the effort and made for a tasty, moist chicken and is something I will definately do again.